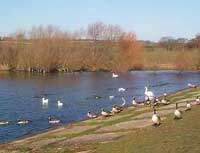 Located between the Roman River and the marshland, the town of Abberton is loved by anglers and bird watchers. During the 1930�s, the damming of the Layer Brook created the Abberton Reservoir. Just four miles south of Colchester, Abberton offers a retreat to nature boasting an internationally renowned bird reserve.